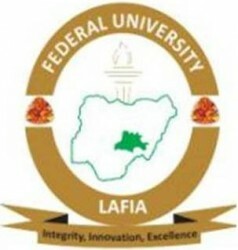 Applications are invited from suitably qualified candidates to fill vacant staff positions into the under listed Departments in Federal University Lafia, Nasarawa State, Nigeria. The candidate who must already be a Professor must have had twenty (20) publications, five (5) of the total number of publications should be offshore (15 of which must be journal articles) and record of supervision of Ph.D and Masters Students. For Faculty of Medical Science, a degree in Medicine, registration with Medical and Dental Council of Nigeria will be an added advantage. The candidate who must already be a Reader must have a Ph.D degree in relevant field with evidence of outstanding and continuing achievement/teaching experience in a University. Fifteen (15) publications in reputable international and national journals and record of supervision of Ph.D and Masters Students. The candidate must have a Ph.D degree in the relevant field from a recognized institution plus six (6) years post qualification teaching and research experience. The candidate must also have a minimum of seven (7) publications in reputable journals with evidence of continuous research and ability to supervise graduate students. The candidate must have a Ph.D degree in the relevant field from a recognized institution plus three (3) years teaching experience and two (2) journal publications all of which must have been published or Ph.D with professional registration plus two (2) published journal articles or a Masters degree plus six (6) years teaching experience plus five (5) journal articles, three (3) of which must have been published. The candidate must have a Ph.D degree in the relevant field from a recognized institution or a Masters degree plus one (1) journal publication and at least three (3) years post qualification teaching and research experience at the University level. The candidate must have a good second class honours degree in the relevant field from a recognized institution plus a Masters degree. The candidate must possess MBBS plus one (1) year NYSC or Exception certificate. The candidate must possess B. Sc. (Pharm) with full registration with the Pharmacist Council of Nigeria plus one (1) year NYSC or Exemption certificate. Medical Laboratory Scientist II The candidate must possess a good first degree in Medical Laboratory Science (MLS), plus registration with the Institute Medical Laboratory Technology of Nigeria (IMLTN) plus one (1) year NYSC or Exception certificate. Candidates should forward ten (10) word processed applications and photocopies of detailed curriculum vitae with copies of credentials addressed to The Registrar, Federal University Lafia, P.M.B. 146 Lafia, Nasarawa State. xviii. Any other relevant information. Candidates submission should be forwarded in an envelope which should have the position applied for clearly indicated in the left hand corner. Candidates should also request their referees to send reports on them under separate confidential cover, directly to The Registrar, Federal University Lafia, P.M.B. 146 Lafia, Nasarawa State. All Applications should reach the undersigned not later than six (6) weeks from the date of this publication. Please check the University website www.fulafia.edu.ng for update.